The British Museum puts a fresh spin on the Norsemen, but its vast new galleries lessen the show’s impact. With the Vikings and us, it’s personal, isn’t it? Lots of trespassers from abroad have arrived in Britain in the past and behaved abominably, but as far as our national consciousness is concerned, the worst visitors of all were surely the Vikings. Rapine. Slaughter. Lamentable havoc. Terrified people and fiery dragons. Yup, that’s the Vikings. Descriptions of their ferocious assault on the great monastery of Lindisfarne in AD793 have excited and misled countless generations of British schoolkids. The idea that their arrival was some sort of divine Dark Age punishment visited on these islands for the sins of the Anglo-Saxons has embedded itself in our national consciousness. But it’s not, of course, what actually happened. The British Library owns seven copies of the Anglo-Saxon Chronicle: none of them is included here. This small act of avoidance makes immediately obvious that this show has not set out merely to illuminate history or adjust it. This event is after something bigger. What we have here — not just in the exhibition, but in the ambitious cinema release that accompanies it; in its official link-up with Mumsnet, which brings viewing days for mums and babies; in the family trail, which directs children in a child-friendly direction — is a cultural rewrite on that most profound of societal levels: the schoolkid level. 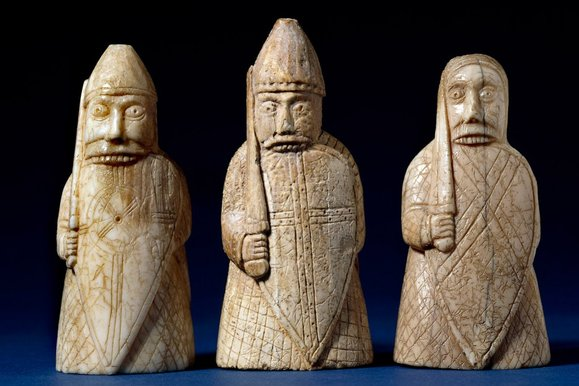 The first of the show’s revisionist acts is to depersonalise Britain’s relationship with the Vikings by presenting them as an ubiquitous international presence. We’ve known for some time that these brilliant voyagers reached America half a millennium before Columbus. But their journey in the opposite direction, the penetration of Russia and the Middle East, is an eye-opener. By sailing down the Volga and across the Caspian Sea, the Vikings eventually arrived at Samarkand, in modern Uzbekistan. In the Mediterranean, they reached Muslim Spain and the North African coast. I knew they had sailed as far as Istanbul, because I once saw some Viking graffiti on the balcony of Hagia Sophia, which said something like: “Harald was here.” But their adventures in the deeper Islamic world are astonishing. The most vivid evidence of this Viking internationalism is supplied by the shiny heaps of twisted silver that make up the Vale of York hoard. Discovered by metal-detectorists near Harrogate in 2007, it consists of 617 assorted international coins and various bits of symbolic international silver, all packed into a Frankish cup. Amazingly, most of the coins are Islamic dirhams. 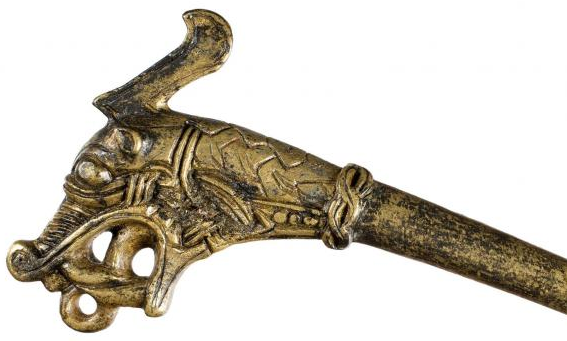 It turns out that the most common inscription found across the Viking world is: “There is no god but Allah.” It appears also in the necklaces and brooches fashioned from Islamic silver worn by Viking women. The insistent presence of Allah in the Viking world is evidence not only of the hefty trading with the Islamic east that underpinned the Viking expansion, but of a very different ancient world from the one we usually envisage: an ancient world crisscrossed with inventive trade routes and displaying a precocious taste for globalisation. Having carefully separated Viking history from our own, the show goes on to illuminate different, telling aspects of Viking society. Central to all their achievements was their prowess as sailors. For the Vikings, water was a pathway, not an obstacle. The first objects we see here are charming toy boats carved by dutiful Viking dads for excited Viking sons. To its credit, the show enlarges our image of the Vikings, but does not attempt to whitewash it. Much of their international trade involved the selling of slaves. Their own were called “thralls”, and a recent test in Iceland proved that although Icelandic men are of remarkably pure Scandinavian stock, the women have high quantities of DNA from Ireland and Scotland. Among the most gruesome of the surviving artefacts in the show is a set of heavy-duty Viking manacles borrowed from the National Museum in Dublin. Pity the poor Irish lass dispatched to Iceland with those around her legs. Much of the slave trade, however, was with the Islamic world, where the demand for “unpaid servants” was particularly high. This is the first exhibition to be mounted in the BM’s long-awaited Sainsbury Galleries. Built at a cost of £125m, the huge new wing provides a much-needed location for all those big new understandings of the ancient world with which the museum has been bombarding us during Neil MacGregor’s inspired tenure as its director. By using art to understand the past better, MacGregor is changing the way we view the present. It’s a marvellous museum strategy. Unfortunately, these huge new spaces seem initially to defeat those good intentions. There’s an awful lot of grey walling on display here, filling out the gaps. I could have done with fewer bits of helpful audiovisualisation and many more artefacts. Most of the exhibits are so battered now that no amount of helpful explanation can endow them with wow factor. Yes, I was impressed by the sheer quantity of gold needed to make the Viking neck ornament that weighs 2kg, but the chap who made it appears to have learnt his jewellery skills while knotting ropes for boats. 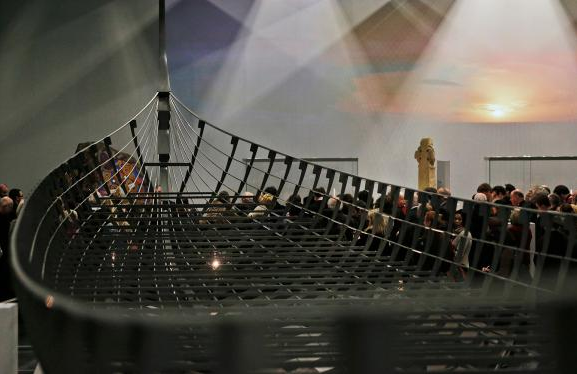 Even the show’s supposed highlight, a full-size re-creation of the largest Viking warship ever found, has a fragmentary impact. It consists of just 20% original woodwork, embedded in a gigantic stainless-steel framework — its dimensions are impressive, but its textures are not. Padded out with quotations, diagrams, explanations and maps, the entire show has a virtual feel to it, an effect exaggerated by the dimensions of the new space, which towers over you like an industrial warehouse. The roof, in particular, has something of the Costco store about it. I hate to say this, but the BM is going to have real trouble filling this metal ravine.